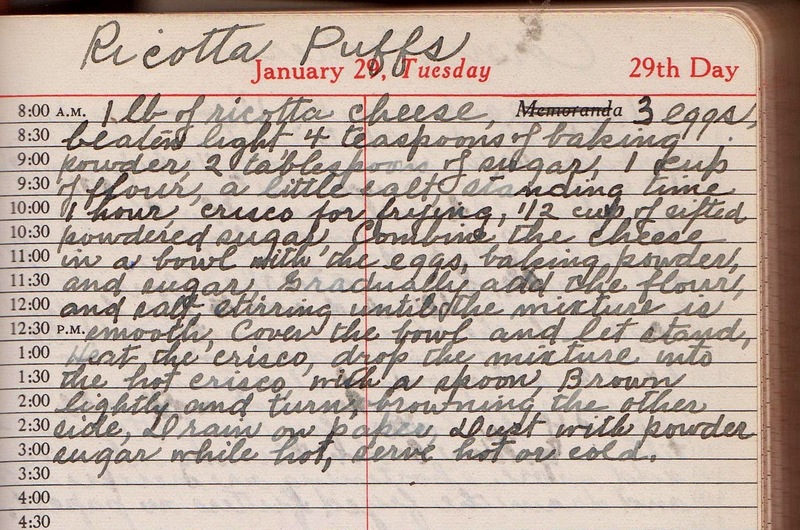 Here's another winning recipe from Grace Johnson's c. 1950s hand-written cookbook purchased last year at a stoop sale near my house. 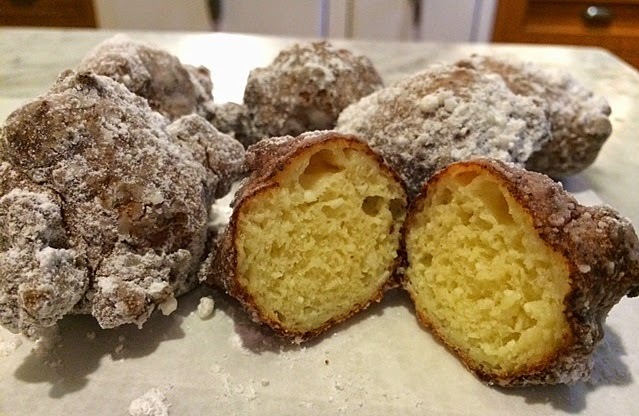 Ricotta cheese puffs, I learned (thanks, Google) are traditionally served in Italy at Carnevale, the last celebration before lent begins. But trust me, these are good any time (especially if one's baking oven is broken and making desserts on the stove top is called for). 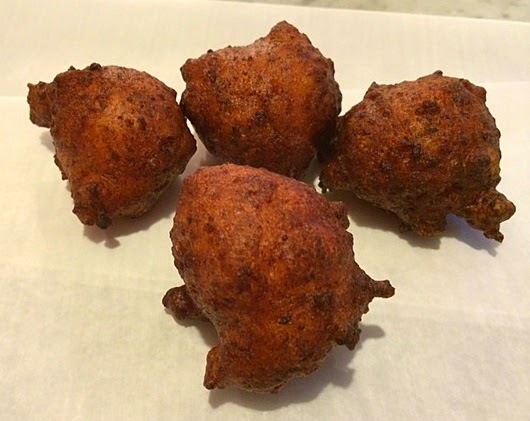 These are reminiscent of doughnuts, but are packed full of protein. In fact, if you have a child who's a fussy eater, ricotta cheese puffs would be a great way to entice them to each some nutritious calorie-packed dairy. I recommend using an excellent ricotta (often available at specialty or Italian shops) instead of the bland supermarket variety. After all, the cheese is the star of this dessert. Start by making the batter. (I neglected to take many photos, as I was distracted by a house full of guests when I made these). Below, is the end of the batter. Then dust with confectioner's sugar. I put the sugar in a paper bag and, adding a couple of puffs at a time, shook to cover them. Below is the recipe as written and, below that, is the same recipe written in an easy-to-follow method. What I love about Grace Johnson's book, is that it is full of the ethnic recipes (Chinese, Jewish, etc.) popular in Brooklyn in the 1950s and 1960s. 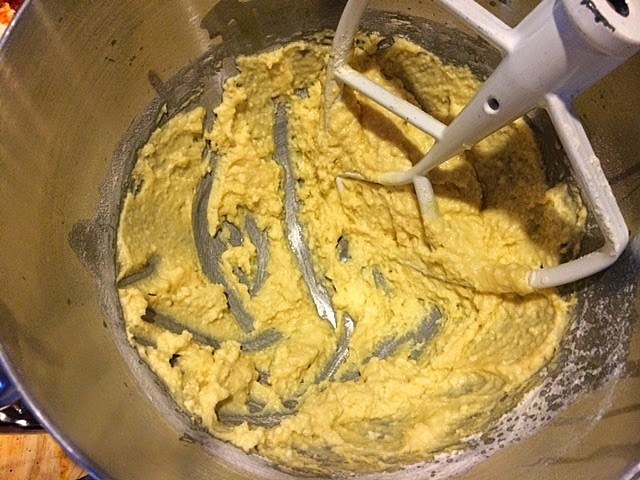 Beat eggs until light in a stand mixer (or in a bowl, using a hand mixer). Add the ricotta, baking powder and sugar. Mix well. Gradually add one cup of flour and a pinch of salt, stirring until the mixture is well combined. Cover and let stand for one hour. Heat oil in a saucepan until it reaches about 360 degrees or so. 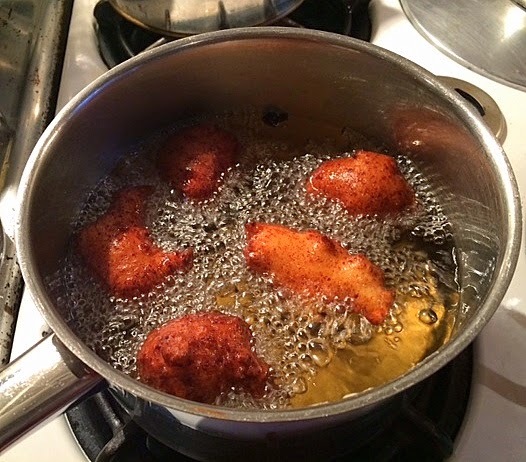 Drop batter into oil with a spoon. Brown lightly and turn to brown the other side. Remove with a slotted spoon and drain on paper towels. 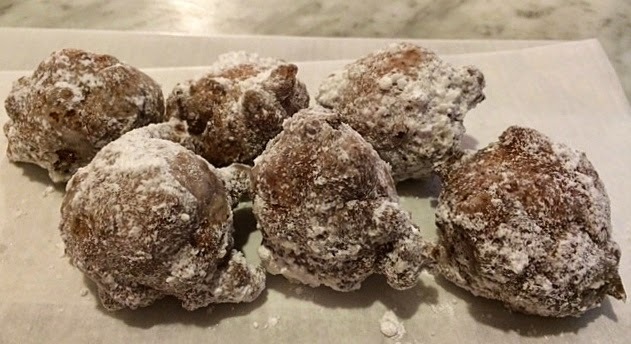 Place confectioner's sugar in a paper bag and put a couple of puffs in at a time, and shake to cover puffs with the sugar. Serve and enjoy! Production notes: I used high end ricotta, purchased at a cheese shop, instead of the supermarket variety, since ricotta is the star of this dessert. These look fabulous! I really must make them! Thanks for sharing Grace's recipe. Thanks for writing, Kat. These were really good and pretty easy too. I wonder what these would taste like soaked in syrup a la "luqmat al qadi." Probably a bit over the top, but sometimes it's nice to gild the lily lol.